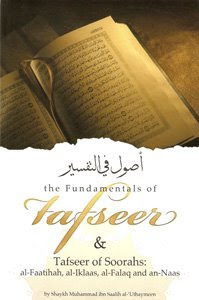 One of the most important sciences of knowledge, rather the most important and noble of all sciences is the knowledge of Tafseer, which is the explanation of the meanings of Allaah's speech. The people of knowledge have established fundamentals for it, just as they have with the science of Hadeeth or Fiqh. I have already written a simple work regarding this knowledge for the students attending the Knowledge Institute at Imaam Muhammad ibn Su'ood Islaamic University. Some people requested that I make it a separate book to make it easier and more thorough. As a result, I have now done this, and I ask Allaah to benefit others by it. Why do Muslims Reject Atheism? What is a Salafi and What is Salafism?